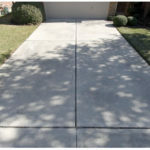 It is important to keep your driveway clean in areas that are super shady and exhibit black mildew. I have such an area on my sidewalk/testing lab next to my garage that never sees the sun and is in constant shade. I failed to periodically bleach clean and pressure wash that area and the black pigment from the mildew leeched into the top of the SlabGasket. I have had customers stain or paint SlabGasket. Any paint that will stick to vinyl will stick to SlabGasket, although in high traffic areas will eventually wear off. 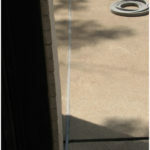 SlabGasket is not warranted against mildew staining. Besides me, I have only had two customers out of nearly 10,000 who have ever said anything about this. Most of us really just want it to work and not so worried about how it looks over time. It has been now in my driveway/testing lab over 10 years and otherwise still looks good. 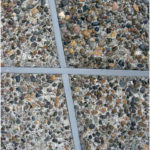 Concrete Overlays and Spray On Decking - WOW!